North of the Village is the Stadium. It is currently under construction and will have a capacity of 65,000 spectators. The Stadium will host the Opening and Closing Ceremonies. Completion date is Feb 2015. Much like its mountain biking counterpart, the BMX Velopark is located south of the Flag Square and European Games Park, opposite The Ramada Hotel and Waterpark. The Mountain Bike Velopark will be a temporary facility built specifically for the European Games. The Athletes' Village is made up of 13 Residential blocks and will host up to 9,000 athletes and officials. Of the 13 residential blocks, three will be completed this month in readiness for the two test events (European Youth Olympic Trials and European Rhythmic Gymnastics Championships) in May and June of 2014. These three blocks will accommodate up to 1,500 athletes and officials, and will also house a dining hall with a 700-people capacity, recreation areas, a welcome centre and small medical services centre. The Media Village is located next to the Athletes Village in the Village cluster. Free transport is available between the media village and venues as part of a “T-ALL” loop system. Journalists will be able to work in every venue, will have access to the Athletes Village and will have working areas in the media village. The Fairmont hotel has been confirmed as the European Games Family Headquarters in 2015. This 5-star hotel is located in the iconic Flame Towers close to the Old City of Baku and is part of the luxury FRHI brand featuring hotels throughout the world. This is Azerbaijan’s largest stadium and holds 31,200 seats. It is the home ground for the Azerbaijan national football team and is also used by the Azerbaijan Premier League clubs in the final rounds of European competitions. The National Gymnastics Arena will host the disciplines of Artistic, Rhythmic, Acrobatic, Aerobic and Trampoline, where competitors will strive to outdo each other in flexibility, agility and pure daring. Construction is due for completion in February 2014. Located at the southern end of the Flag Square Cluster, the Baku Aquatics Centre will host the Swimming, Synchronized Swimming and Diving competitions. The venue is currently under construction. The Water Polo Arena is located at the southern end of the Flag Square Cluster. This is a temporary outdoor venue with a capacity of 2,000 spectator seats. Another outdoor venue that is located immediately adjacent to the Water Polo Arena. It is also a temporary outdoor venue, with a current capacity of 3,000 spectator places. The arena for basketball games will welcome the Basketball 3 on 3 competitions,to be conducted during 4 to 7 days. Crystal Hall is located in the center of the Flag Square Cluster on a dramatic peninsula jutting out into the Bay of Baku. This very adaptable and multipurpose venue recently hosted Eurovision 2012 and will receive an additional permanent upgrade in preparation for the Games. The Baku Sport Hall tops off the northern edge of the Flag Square Cluster. This existing venue will receive a major permanent upgrade that will be completed by February 2015. The Heydar Aliyev Sports Arena is a 20-minute journey from the Athletes Village. 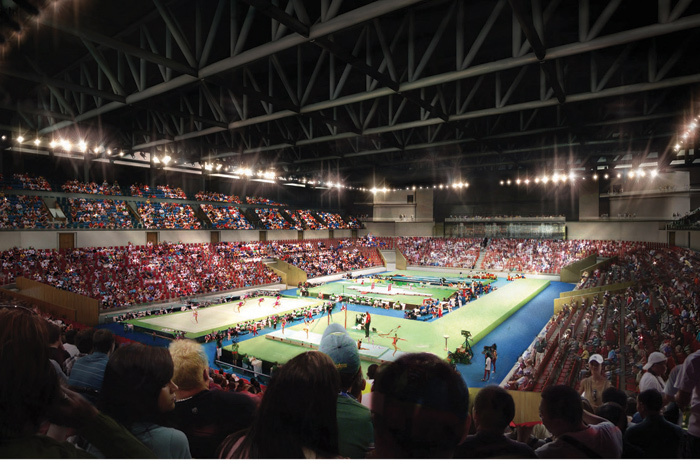 This venue has hosted numerous sporting events and will be the home of Judo and Wrestling for the Games. The back of house and warm up areas of this venue will receive a major permanent upgrade for 2015. The Baku Shooting Centre is a 30-minute drive west of the Athletes Village. The existing venue will receive a permanent upgrade as part of the legacy of the European Games. This venue was inspected by the European Canoe Association, which has given it preliminary approval to hold the Canoe competition, subject to detailed plans. Baku boasts one of the few bespoke gymnastics arenas in the world thanks to the support of Azerbaijan's First Lady Mehriban Aliyeva. Officially opened in April by President Ilham Aliyev and the First Lady, head of the Organising Committee for Baku 2015 and, coincidentally, the Azerbaijan Gymnastics Federation, the National Gymnastics Arena will be a centrepiece venue for the European Games. The iconic Arena will play host to all gymnastic disciplines at the Games including artistic, rhythmic, acrobatic and aerobic, with the trampoline event also set to be held here. Located between the rail-line and main road from the airport, the Arena will be easily accessible for all athletes, spectators and media personnel. It will sit within the Village Cluster, positioned just a mile away from both the Athletes' Village and main Olympic Stadium. The Arena was designed by global architecture, urbanism and design practice Broadway Malyan, following a competition-winning design entry in 2011. The design project included development from start to finish, encompassing architectural, interior and landscape design, as well as graphics, way-finding, signage and ticketing. Broadway Malyan's approach was to prioritise the spectators' experience and gymnasts' needs and address the unique challenges of venue design by combining an intelligence-led design approach with a deep understanding of the intangibles, such as "atmosphere", that make venues successful. The resultant design symbolises Azerbaijan's strong gymnastics heritage and takes inspiration from the ribbon of the rhythmic gymnast, featuring three ribbon louvres to control daylight and solar gain and create views. 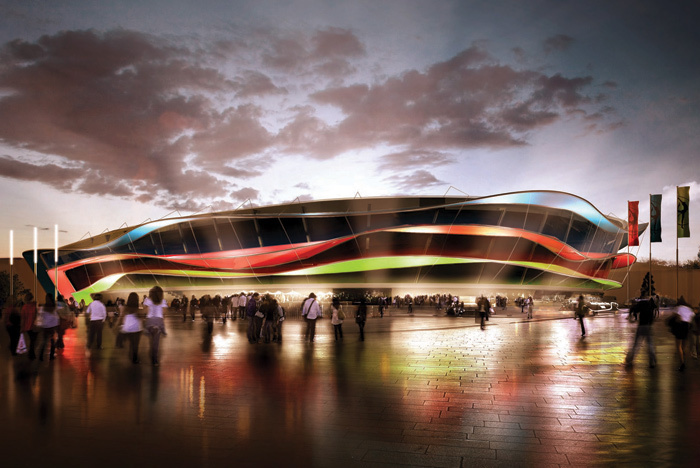 At night dynamic lighting will make the arena appear as three ribbons in Azerbaijan's national colours ﬂuttering over a stone plinth, with the lighting scheme also enabling the projection of lighting displays and dynamic imagery. Inside, the Arena is designed to host all gymnastics disciplines, while also having the flexibility to host other sporting and cultural events through its retractable and movable seating tiers. These tiers allow the Arena to vary its capacity from 5,000 to 9,600 seats, depending on the scale and nature of the event it is hosting. It also features a training hall for the national Azerbaijan gymnastics team, which can be integrated into the main Arena space and includes accommodation facilities, as well as physiotherapy and medical suites. The Arena is set within the 24,000 square metres of surrounding landscape designed to complement the building and includes an underground car park capable of parking at least 300 vehicles. Within this area, visitors will also find a hotel as well as a press centre, first aid station, dance hall and gym, doping control rooms, offices, shops and cafes. Costing in the region of $200 million, the Arena is one of only a handful of bespoke gymnastics venues in the world. The Arena is due to stage its first major event when it hosts the 30th European Rhythmic Gymnastics Championships on June 13 until 15. More than 30 countries are expected to take part in the Championships when competitors will be housed in the new Olympic Village built for the 2015 European Games. In 2015, it will host six events in gymnastics disciplines at once during the Games, while in 2019 the Rhythmic Gymnastics World Championships is also planned to be organised at the Arena. These will not be the first major rhythmic gymnastics competitions to be held in Azerbaijan, with the country boasting a highly successful delivery portfolio, including the Rhythmic Gymnastics World Cup Competitions in 2003 and 2004, the World Championship in 2005 and the European Championships in 2007 and 2009. Up-to-date gymnastics equipment is installed in the hall according to the recommendations of the European Union of Gymnastics and Azerbaijan Gymnastics Federation. National teams in rhythmic and men's artistic gymnastics, as well as trampoline and acrobatic gymnastics and tumbling currently train in the Arena. Courses for coaches are also organised here by the Academy of the International Federation of Gymnastics. For the last two months, gymnasts from Turkey, Kazakhstan, Latvia, Mexico and Hungary have taken part in the training camp held in the hall. It is expected that athletes from Canada, the Czech Republic, Greece and Finland will join the training camp to be held in the near future. Each week we’ll be talking to one of the 50 countries about their preparations for the First European Games in Baku.